I haven’t had an opportunity to write you earlier this week as we have had nonstop action. Since August 6, we have visited four museums in Pueblo, gone on the Royal Gorge Train again, and yesterday spent 5-1/2 hours at the Royal Gorge Bridge and Park. I’ll be writing you about the museums in another email. We went on the train this past Wednesday. What we learned is if you’re interested in narration, book the Vista Dome cars. That’s what we did the first time. However, we quickly learned that class’s windows with concave mirrors and lots of glare cuts down dramatically on taking decent photos. This time we traveled in one of their Coach Cars. In this class of service, forget narration, you can barely hear the speakers. However, next to our car was an Open Car which was great for photography. Unfortunately, the Open Car did not have any seats - bench or otherwise. I lasted standing for a half hour, then later 15 minutes, before giving up and shooting from my seat in Coach. Earl stayed out in the Open Car longer than I did. This time with sun, instead of the dark clouds we had the first time, we probably took about 250 photographs on the two-hour ride. Earl has downloaded them and said they turned out fine. Yesterday we spent a full day at the Royal Gorge Bridge and Park. It’s located eight miles west of Canon City. It is best known for its suspension bridge, aerial car, and incline. However visitors also find two thrill rides, shows, places to eat, gift shops, and other attractions as well. You can walk around the park, ride and stop at various points in a trolley, or do what we did - rent a golf cart for $12 the first hour and $6 each hour afterwards. The gorge is spanned by what is touted as the world’s highest suspension bridge, which was completed in 1929. Measuring 1270 feet long, it’s suspended from two 300-ton cables. It’s 956 feet above the Arkansas River and 18 feet wide. One thousand tons of steel in the floor and 1270 wood planks, of which about 250 are replaced annually, comprise the walkway. When the wind picks up, you can feel a sway. The Bridge is listed on the National Register of Historic Places. 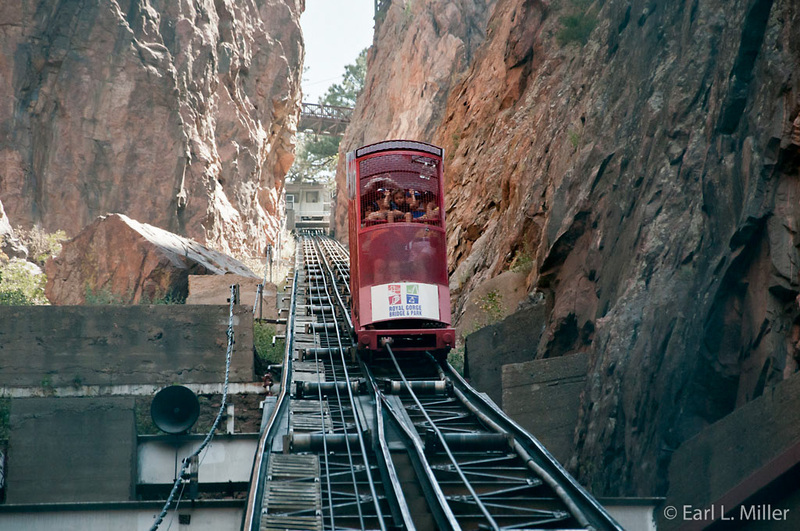 The incline railway, believed to be the world’s steepest, was completed in 1931. It plunges 1,550 feet from the gorge’s rim to its bottom at a 45-degree angle. The park runs two railway cars with one descending while the other rises. Travel time takes 5-1/2 minutes each way at 3 miles per hour. You can fit two people in each of the cages. It’s also on the National Register of Historic Places. After lunch, we attended two shows at the park’s Palace Theater. The first was a 15-minute video on the history of the area. Zebulon Pike of Pike’s Peak fame was the first explorer to see it. When he viewed the area in 1806, he thought man would never conquer it. 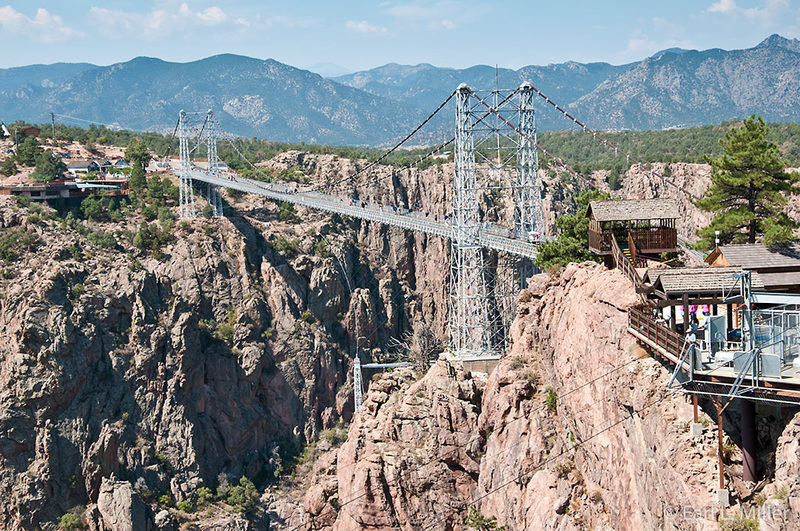 By 1877, the Denver and Rio Grande built a railroad through the canyon, and the Royal Gorge is now one of Colorado’s leading attractions. The video also covers the bridge’s construction and provides information about the park’s attractions. Arrive early at the theater to see information and historic photographs on the Railroad Wars, which occurred in this area, and on the bridge’s construction, incline, and aerial tram. This was followed by a 15-minute magic show. Christian Augustine, the magician, performed very good illusions, particularly those dealing with levitation. He drew a picture of a bowling ball and one magically appeared from the page he drew. He has been on MTV, PBS, and the Discovery Channel. The magic show runs four times a day and alternates with the video. We drove the golf cart over to their Mountain Man area. There they’ve developed trading posts, a replica of a western town, and a gunfight scheduled a couple of times a day. We saw the 2 p.m. show. They also have free burro rides for youngsters. Our next stop was Wapiti Western Wildlife Park. We saw Rocky Mountain bighorn sheep, Colorado’s state animal. We also spotted an elk and a small herd of bison, including some rare white ones. We learned their wildlife park is involved in a breeding program. The park also offers three rides. We took none. A carousel provides seats for adults and children with 30 animals and two chariots. This one is included in the price of admission. For an extra cost, they offer a zip line and a skycoaster. On the coaster, one to three people are harnessed for a ride that swings over the gorge at speeds of 50 miles per hour. The zip line has two zip lines carrying two riders, each at 35 miles per hour. For a fee, they also offer half hour, one hour, and two hour trail rides on mules. We returned our golf cart and then walked over to the Silver Rock Railroad. It consists of open air cars pulled by a 1893 locomotive. The one mile ride is hokey. For example, at the opening of a tunnel, the engineer says they have lots of bats. There are Louisville Sluggers. Petticoat Junction was, you guessed it, petticoats hanging from the sign. If you are tired at the end of the day, skip this one. Plan on a full day when you visit. The park opens at 10 a.m. Closing times vary depending on the time of year from 4p.m. to 7 p.m. Tickets are $26 for adults, $22 for seniors, and $20 for children ages 4-11. We took today off to clean the motorhome. Tomorrow is another free day and I hope to write my piece on Pueblo’s four museums then. On Wednesday, we travel to Alamosa for three nights. We have booked the Cumbres & Toltec Scenic Railroad and hope to visit Sand Dunes National Park.